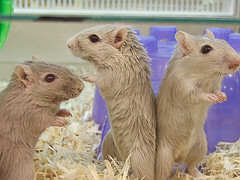 Gerbils are social animals that live in groups in their natural habitat, when choosing these as pets it is best to consider keeping a pair, as they do like company, it is best to have two from the same litter so they do not fight, keeping males and females separate so they do not breed. In addition to commercial food, give them a variety of fresh fruit and vegetables, as with all pets make sure that a fresh supply of water is readily available, drip bottles are ideal for this. Being very active animals they do require a fairly large area to allow them to burrow. Large fish tanks are favored by many, as you have the depth to allow them to build a nest and burrow away.Paper and card should be made available, to allow them to shred into bedding. Keep the tank or cage away from cats and dogs. Curious little animals that like to dig a burrow shred paper charge around their cage, they are very active and enjoy all kinds of objects that they can run through, jump in and out of but remember they love to shred and chew. Use simple objects like cardboard boxes and tubes that will help burn up their energy and satisfy their curiosity. 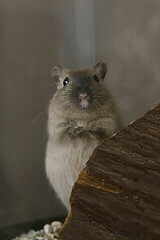 Daily handling of your Gerbil will soon have him hand tamed. To pick your pet up cup your hands and scoop him up. This will be necessary when you are cleaning out the cage and replacing fresh bedding and burrowing material, it is always a good idea to rub your hands in the bedding so as to disguise any smells of food on your hands, that way you will not be mistaken as a meal or tasty morsel.